the fusion projects: "bon voyage"
In „bon voyage“ a moving image is being created, which resists the limitation of the space: static of an installation, using limited movement-material, associations to flying (movement with hte least restrictions)? 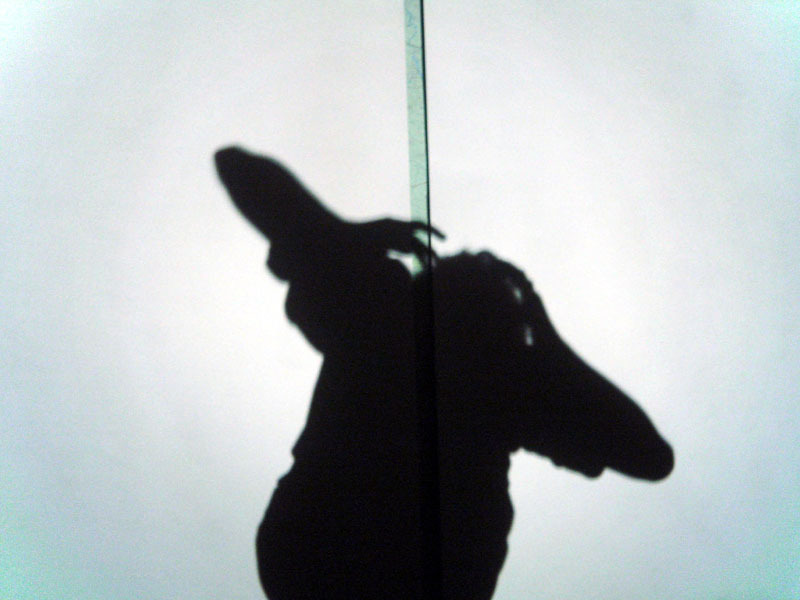 Projecting the figure on the wall as shadow breaks the rules of limited space,and takes it out of its limitations. Angela Stoecklin was born and grew up in Iran and Nepal, since 1979 she lives in Switzerland. Arts-school in Basel. Professional dance education at ch-Tanztheater Zurich. Since then free-lance dancer and choreographer. Various dance contracts in Switzerland, Germany, Belgium and projects of her own: short pieces, performance art, installative pieces, evening-long productions, interdisciplinary formats. Member of x-group and TARA-Projects (Instant Composition). Cultural exchange project “instants”: Instant Composition music/dance with artists in and from different cultural backgrounds. Since 1994 practicing Taiji and Qi Gong, since 2003 instructor. Studied acupressure at Schule für Körpertherapie, Zurich, works in her own praxis. Geboren und aufgewachsen im Iran und Nepal, seit 1979 in der Schweiz. Kunstgewerbeschule Basel. Tanzausbildung ch-Tanztheater Zürich, seither freischaffende Tänzerin und Choreographin. Diverse Engagements und eigene Projekte. Kurzstücke, performative und installative Stücke, abendfüllende Projekte und interdisziplinäre Formate. Mitglied der x-group und der TARA-Projects (Instant Composition). Kulturaustausch-Projekt "instants": Instant Composition Musik/Tanz mit Künstlern in und von unterschiedlichen kulturellen Hintergründen. Unterrichtsatätigkeit in Zeitgenössischem Tanz und Tanz-Improvisation / Instant Composition. Seit 1994 Taijiquan und Qi Gong, seit 2003 Instruktorin. 1998-2003 Akupressur-Ausbildung, Schule für Körpertherapie Zürich. Seit 2003 in eigener Praxis tätig.